The Royal Suite's dining room at Claridge’s, London. Ranked #87 in our countdown of the 100 Best Hotels and Resorts in the World. 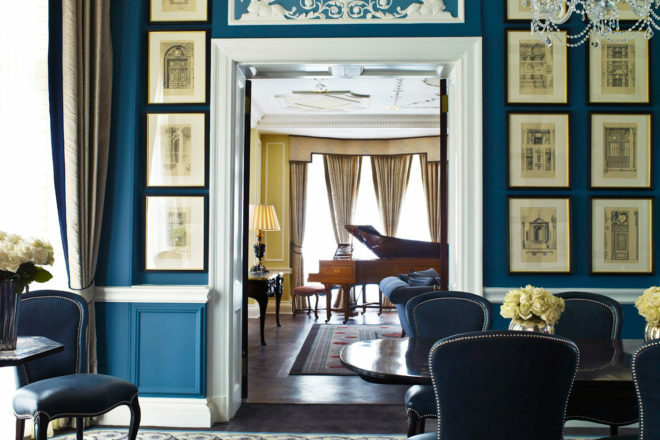 A bastion of British hotel tradition, within a heartbeat of the best London has to offer (this is Mayfair, darling) with authentic 1920s Art Deco extravagance, interiors by a bevy of contemporary designers (like Diane von Furstenberg) and spot-on service – no wonder Claridge’s has kept its top position for generations. Guest rooms are superbly comfortable and each suite is unique (the Linley suites have particular panache). There’s a theatre desk for West-End must-sees, dinner in the Reading Room is a standout, the afternoon tea is famed (you must book) and at the ’30s-inspired Fumoir bar cocktails come in Lalique. Did you know Spencer Tracy said when he died he’d rather go to Claridge’s than to heaven.